This post is filed under Broccoli, Chicken, Frozen, Hall of Shame (Looks), Hall of Shame (Taste), Marie Callender's, Microwave, Rice. I’ve eaten this once before and have sworn to never eat it again. I don’t care how you cook it — this is pure crap in a plastic bowl. You should try the Marie Callender’s pot pies. I tried one a few days back because it was on sale or had a coupon or something. You overcooked it. I buy this thing ALL the time and mine never comes out looking like that. 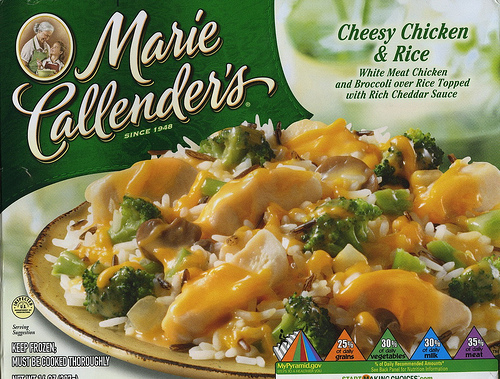 I think it’s absolutely delicious, the only Marie Callender meal that hasn’t turned to complete crap since the economic decline (and therefore cheapening of ingredients). Oh sure, the chicken isn’t as big as it is on the box, but it’s delicious all the same, in my opinion. 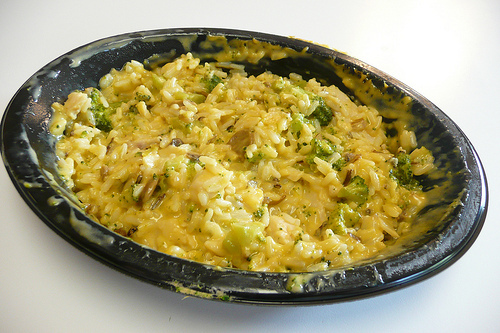 Try MC’s Chicken Alfredo with Broccoli (I forget the exact name of the dish), THAT is some awful stuff, the sauce is like water. I agree, it is overcooked in the picture and the meal is really one of the best! just for the way it looks… i will never EVER put that vomit looking paste crap in my mouth! I have an idea that would benefit your company. I enjoy your pot pies a lot and my wife thinks they are great. My question is ,if I submit an idea, do I need a patent. I am on social security and my wife is on unemployment,so I cannot afford a patent attorney. My name is james grimes, my e mail address is jgri1945@yahoo.com. I actually bought this and mixed in already cooked rice because I knew the cheese sauce would be too much. It stretched to feed 4 people instead of 1, and was pretty passable. Oh come on! You obviously mixed this up and made it look like that. The only reason the cheese would be all over the sides would be if you mixed it up. You must work for one of Marie’s competitors. I hate intellectually dishonest people. @k: The directions included mixing it up, so I mixed it up. It doesn’t change the fact that it tasted like glue. Süper Harika Güzel Site Başarılar Dilerim Dostum.